Over the past few years, the definition of “board certified” has changed from a one-time test to an ongoing series of tests, hoops, and fees to maintain certification through the MOC program. Not participating in any portion of the convoluted and expensive MOC program results in loss of board certification, but so what? Board certification, either as initial certification or 20 years into maintaining certification is voluntary, so what’s the big deal? On December 17, with the blessing of my partners, I decided to test how “voluntary” board certification is. Over the past 13 years, I’ve passed my board examination twice, completed multiple proprietary online tests, and completed three ABP research projects on my patients. But when the American Board of Pediatrics threatened to revoke my certification and nullify 13 years of testing and research projects if I didn’t pay $1,300 to “maintain certification,” I had enough. 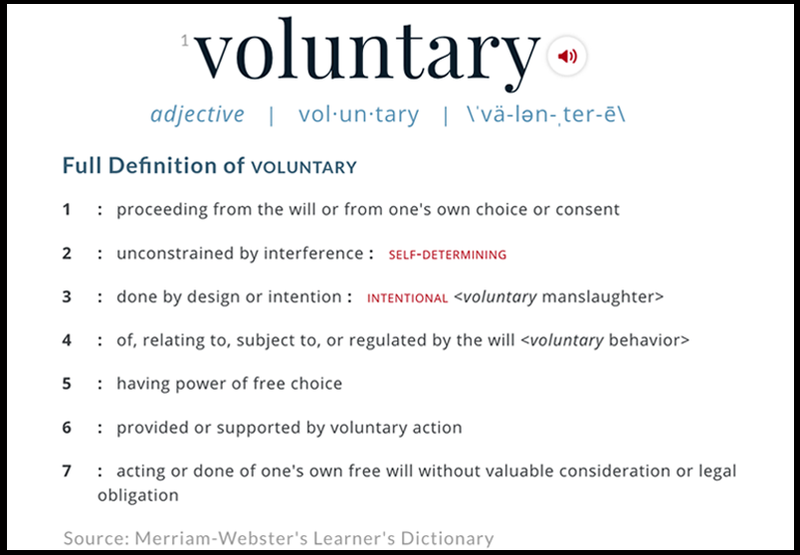 I didn’t pay, and voluntarily gave up my board certification. I wrote a letter explaining why, so there wouldn’t be any confusion. To date, that letter has been read 100,000 times. Clearly, I hit a nerve among my colleagues. But what would happen to me professionally? What happens to doctors who stop doing MOC? 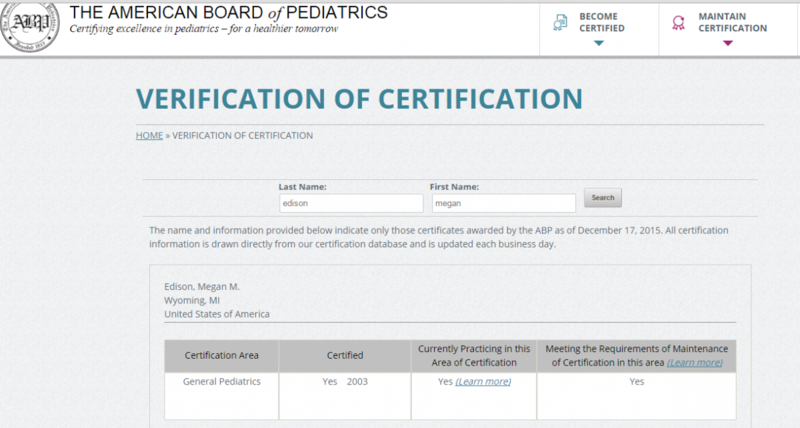 First off, after many threatening emails, the American Board of Pediatrics erases the name of any doctor who fails to complete any of the four parts of MOC from their website. Erases. December 17, there I am. And now, I don’t exist. Grandfathered doctors, like ABP president David Nichols, are listed as “Board certified, not participating in MOC,” but those of us who have passed multiple board exams and a decade of MOC? Erased. Obviously, they have the technical ability to list us as, “Board certified, not participating in MOC,” but they don’t. They erase our names, as if we’d never passed our boards to begin with. The only way to find out that I’ve passed two board exams is to write the ABP and pay $40 for a release of information. Why would they do such a thing, why make this so difficult for us? Because their website has the power to destroy our careers, that’s why. Four weeks after my Open Letter to the American Board of Pediatrics was published, my name was erased from the ABP website and the threats began. 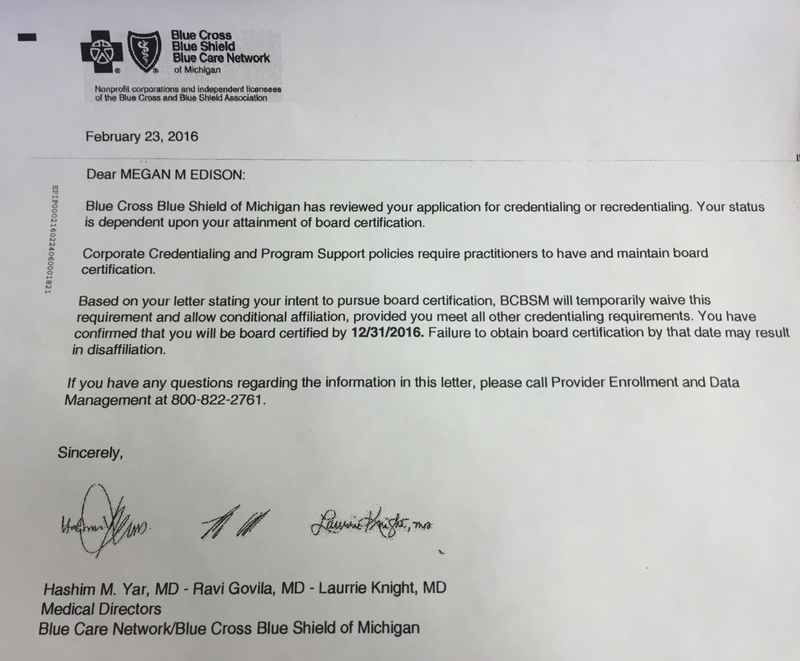 On an insanely busy Friday afternoon in February, I was called by Blue Cross Blue Shield of Michigan/Blue Care Network, and informed that I had to immediately cease from seeing any of my BCBS/BCN patients. Immediately. They checked the ABP website, my name was no longer listed, and I was therefore no longer allowed to see my patients. I asked if I could have a colleague co-sign my notes, and that was not allowed. I asked it I could see my patients and not be paid. They said I was forbidden from seeing my patients. I submitted my board certification through the National Board of Physicians and Surgeons, and was told only ABMS boards were allowed. I asked if I asked if I could see the credentialing policy I was being held to, and was told, “it was proprietary.” All this stress and harassment in Michigan, because I didn’t pay $1,300 to the American Board of Pediatrics, a multi-million certification corporation out of North Carolina. Unbelievable. I pushed back and asked for a departicipation notice in writing, and they backed off. I now have until December 31, 2016, to comply and pay the American Board of Pediatrics $1,500 (with the added $200 late fee, of course), or I will be banned from seeing my patients at that point. So far, six months after dropping my board certification, I’m still standing, but not without a ridiculous amount of harassment and bullying. My scenario repeats itself thousands and thousands of times across the country. Usually, most doctors back down and pay the money, they stop doing CME of their own choosing and complete the education modules decreed by the boards, they stop doing their own novel medical research and instead complete the busywork research for the boards, they give up family time to travel to review courses, they shut down their offices to take secure examinations. Doctors do this out of fear. The ABMS has long banked on fear and intimidation as a business model. That model is coming into question as more and more doctors fight back. Rather than fear, I’m banking on the strength of my fellow physicians to return board certification to its rightful place as a voluntary process: one that is not tied to licensure, hospital privileges, insurance participation. Oklahoma has shown us this is possible. Michigan will take the first step towards freeing our doctors from overreach of the ABMS, as House Bills 5090 and 5091 finally go to testimony before the House Health Policy Committee. I will be there testifying, alongside an incredibly diverse group of physicians finding common ground on this issue. The powerful insurance and hospital lobbies will oppose us, as anticipated. Maybe the ABMS will send someone to plead their case. I remain optimistic that Michigan lawmakers will see MOC for the money-making sham it is, and act on behalf of Michigan doctors and our right to care for our patients without interference by these unaccountable outside board certifying corporations. My hope is that this will be the beginning for other states to follow in our footsteps and return board certification and MOC to a voluntary process, free of fear and intimidation. < Previous post Is it time to change the way we use social media in medicine?